“History of the University of Alabama, volume II, 1902-1952, James Benson Sellers, revised and edited by W. S. Hoole, unpublished manuscript. Araujo, Ana Lucia. Shadows of the Slave Past: Memory, Heritage, and Slavery. New York: Routledge, 2015. Baker, Bruce E. What Reconstruction Meant: Historical Memory in the American South. Charlottesville: University of Virginia Press, 2009. Berlin, Ira. Generations of Captivity: A History of African-American Slaves. New York: Belknap Press, 2003. Berry, Mary Frances. My Face is Black Is True: Callie House and the Struggle for Ex-Slave Reparations. New York: Vintage Books, 2005. Berry, Daina Raimey. The Price for Their Pound of Flesh: The Value of the Enslaved, From Womb to Grave, in the Building of a Nation. Boston, MA: Beacon Press, 2017. Brophy, Alfred. University, Court, and Slave: Pro-Slavery Thought in Southern Colleges and Courts and the Coming of Civil War. New York: Oxford University Press, 2016. Brundage, W. Fitzhugh. The Southern Past: A Clash of Race and Memory. Cambridge: Belknap Press of Harvard University Press, 2008. _____, ed. 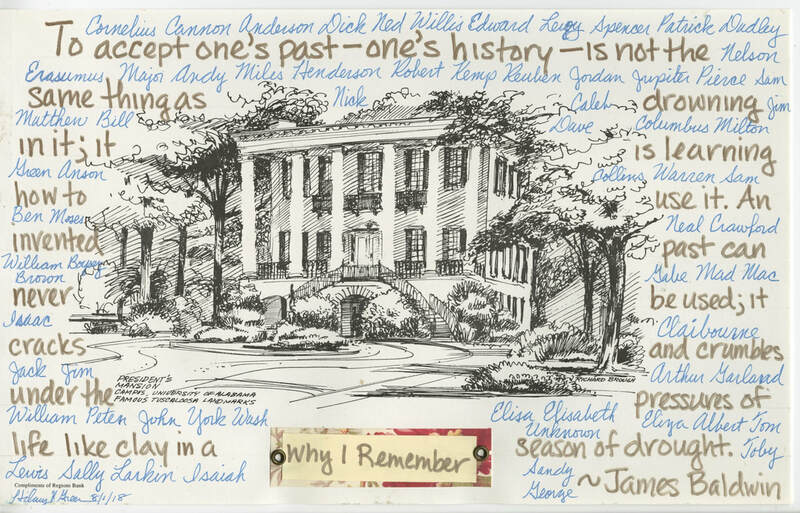 Where These Memories Grow: History, Memory, and Southern Identity. Chapel Hill: University of North Carolina Press, 2000. Clark, Kathleen Ann. Defining Moments: African American Commemoration and Political Culture in the South, 1863-1913. Chapel Hill: University of North Carolina Press, 2005. Clarke, Max and Gary Alan Fine, “’A’ for Apology: Slavery and the Collegiate Discourses of Remembrance – Cases of Brown University and the University of Alabama,” History and Memory 22, no. 1 (Spring/Summer 2019): 81-112. Case, Sarah H. Leaders of Their Race: Educating Black and White Women in the New South. Urbana: University of Illinois Press, 2017. Cox, Karen L. Dixie's Daughters: The United Daughters of the Confederacy and the Preservation of Confederate Culture (New Perspectives on the History of the South): University of Florida Press, 2003. ______, ed., Destination Dixie: Tourism and Southern History. Gainesville: University of Florida Press, 2012. ______. Dreaming of Dixie: How the South Was Created in American Popular Culture. Chapel Hill: University of North Carolina Press, 2013. Du Bois, W. E. B. Black Reconstruction in America, 1860-1880. Reprinted with Introduction by David Levering Lewis. New York: Free Press, 1992. Fitzgerald, Michael. Reconstruction in Alabama: From Civil War to Redemption in the Cotton South. Baton Rouge: Louisiana State University Press, 2017. Foner, Eric. Reconstruction: America’s Unfinished Revolution, 1863-1877. New York: Harper’s and Row, 1988. Gilpin, R. Blakeslee. John Brown Still Lives! : Americas Long Reckoning with Violence, Equality, and Change. Chapel Hill: University of North Carolina Press, 2011. Green, Hilary. Educational Reconstruction: African American Public Schools in the Urban South, 1865-1890. New York: Fordham University Press, 2016. ______. "At Freedom's Margins: Race, Disability, Violence and the Brewer Orphan Asylum in Southeastern North Carolina, 1866-1872," Journal of North Carolina Association of Historians 24 (October 2016): 1-22. Green, Sharony. “Alabama’s Female Academies: Educating Young Women Before and After the Civil War,” Alabama Heritage no. 129 (Summer 2018): 36-43. Hillyer, Reiko. Designing Dixie: Tourism, Memory, and Urban Space in the New South. Charlottesville: University of Virginia Press, 2014. Hollars, B. J. Opening the Doors: The Desegregation of the University of Alabama and the Fight for Civil Rights in Tuscaloosa. Tuscaloosa: University of Alabama, 2013. Horton, James Oliver and Lois E. Horton, eds., Slavery and Public History: The Tough Stuff of American Memory. Chapel Hill: University of North Carolina Press, 2006. Hubbs, G. Ward. Searching for Freedom after the Civil War: Klansman, Carpetbagger, Scalawag, and Freedman. Tuscaloosa: University of Alabama Press, 2015. Hyde, Sarah L. Schooling in the Antebellum South: The Rise of Public and Private Education in Louisiana, Mississippi, and Alabama. Baton Rouge: Louisiana State University Press, 2016. Johnson, Walter. River of Dark Dreams: Slavery and Empire in the Cotton Kingdom. Cambridge, MA: Harvard University Press, 2013. King, Wilma. Stolen Childhood: Slave Youth in Nineteenth-Century America. Bloomington: Indiana University Press, 1997. Kytle, Ethan J. and Blain Roberts. Denmark Vesey’s Garden: Slavery and Memory in the Cradle of the Confederacy. New York: The New Press, 2018. Mellown, Robert Oliver. The University of Alabama: A Guide to the Campus and Its Architecture. Tuscaloosa: University of Alabama Press, 2013. Pargas, Damian Alan. Slavery and Forced Migration in the Antebellum South. New York: Cambridge University Press, 2015. Rothman, Adam. Slave Country: American Expansion and the Origins of the Deep South. Cambridge, MA: Harvard University Press, 2005. Rubin, Anne Sarah. Through the Heart of Dixie: Sherman's March and American Memory. Chapel Hill: University of North Carolina, 2014. Savage, Kirk. Standing Soldiers, Kneeling Slaves: Race, War, and Monument in 19th-Century America. Princeton, NJ: Princeton University Press, 1997. Sellers, James B. History of the University of Alabama. Volume I: 1818-1902 (Tuscaloosa: University of Alabama Press, 1953). Wendt, Simon. “God, Gandhi, and Guns: The African American Freedom Struggle in Tuscaloosa, Alabama, 1964-1965,” Journal of African American History 89, no. 1 (Winter, 2004): 36-55. ____. Self-Taught: African American Education in Slavery and Freedom. Chapel Hill: University of North Carolina Press, 2005. Willis, Deborah and Barbara Krauthamer, Envisioning Emancipation: Black Americans and the End of Slavery. Philadelphia: Temple University Press, 2013. Brophy, Alfred L. University, Court, and Slave: Pro-Slavery Thought in Southern Colleges and Courts and the Coming of Civil War. New York: Oxford University Press, 2016. Fuentes, Marisa J. and Deborah Gray White, eds. Scarlet and Black: Slavery and Dispossession in Rutgers History. Volume 1. New Brunswick, NJ: Rutgers University Press, 2016. Harris, Leslie M., James T. Campbell, and Alfred L. Brophy. Slavery and the University: History and Legacies. Athens: University of Georgia Press, 2019. Oast, Jennifer. Institutional Slavery: Slaveholding Churches, Schools, Colleges, and Businesses in Virginia, 1680-1860. New York: Cambridge University Press, 2016. Platt, R. Eric. Educating the Sons of Sugar: Jefferson College and the Creole Planter Class of South Louisiana. Tuscaloosa: University of Alabama Press, 2017. Wilder, Craig Steven. Ebony and Ivy: Race, Slavery, and the Troubled History of America’s Universities. New York: Bloomsbury Press, 2013.